Design innovation for maximum performance from a minimal footprint! A true collaboration between industrial, mechanical, electronic and acoustic design. Unlike many subwoofers on the market, Seismic™ 110 has no off-the-shelf parts. A completely custom build, demonstrating how good it gets when form truly follows function! Unique Two-Part Cone Construction. The low-profile cone geometry is achieved through a two-part construction. Using the principle of triangulation to lend maximum strength to a compact form factor, the cone is built in two sections: A support cone with I-beam cross-sectional support arms locks the flat outer cone to the voice-coil. The surround is then over molded to the outer edge which becomes an area of high strength when bonded to the outer cone. Overmolded Inverted Corrugated Santoprene® Surround. Derived from research performed on our award-winning Signature Series speakers, the corrugations allow for extreme excursion while retaining stability and exceptional centering characteristics. The inverted surround contributes to the compact low-profile form factor of the overall cone assembly. (50 mm) of extremely linear excursion with vanishing low levels of distortion. 1-1/2˝ (38-mm) Split Voice-Coil Construction. Oppositely wound turns on each coil effectively eliminate motor non-linearity. High temperature wire (adhesive rated to 450 F / 232° C) ensures long-term reliability and very high power handling. Apical™ formers contribute to high stiffness. 10˝ (254 mm) Mineral-Filled Co-Polymer Polypropylene Cone with RCR™ Resonance Control Ribs on the underside. Dual Spider Suspension keeps the voice-coil perfectly centered during extreme excursion. AVS™ Airflow Ventilation System Cooling. Forced-air cooling during large musical transients, chassis convection cooling at all other times. 10-lb (4.5 kg) Computer-Optimized Triple Magnet Assembly with Balanced Field Geometry. Optimized to produce a powerful high-density symmetrical magnetic forcefield while minimizing inductive distortion. Low-Profile High-Pressure Die-Cast Aluminum Chassis. Control flexing and ringing. Aluminum is non-magnetic so stray magnetic losses are eliminated. Shallow basket designed to perfectly accommodate the low-profile cone, reinforcing the overall compact form factor. Two 1/2˝ (12 mm) Thick Steel Top Plates provide plenty of close-contact heat-dissipating surface area and thermal mass to maximize power handling. Innovative Ultra-Class-D™ Amplifier with Switching Power Supply. More than 90% efficiency! Prodigious total output: 1,700 watts of Dynamic Peak Power; 850 watts of RMS Sustained Power. Big Power from a Compact Package. Our low-noise, ultra-high-power, compact transformer (0.4 lb / 0.18 kg) boasts an ETD-core developed particularly for applications that require high power in a small format. The switched-mode power supply benefits from: highest quality MOSFET transistors, noise-suppression networks and an advanced control circuit. The result is tremendous current with ultra-quiet operation. The Full-Bridge Ultra-Class-D™ Design Output Stage. Operates from split power supply rails ensuring exceptionally low distortion. Not only does this design increase the speed of the switching, it dramatically increases switching efficiency. Precision Components and Dual-Sided Military Spec (FR-4 rated) Glass / Epoxy Circuit Boards. Superior ‘Reference’ quality performance with an enviable degree of reliability. Unique Temperature Sensors. Maintain a safe operating temperature, even under extreme operating conditions. Advanced Short-Circuit Protection. Should current through the MOSFETs exceed an internally preset limit, a Silicon Controlled Rectifier (SCR) disables the output stage. Essentially a ‘latching’ device, the SCR will not allow the output stage to be re-enabled until power is reset. Reaction time is typically within 10 μs. Novel Adaptive PWM (Pulse Width Modulation) Power Processor. Minimizes distortion and optimizes efficiency. Conventional Class-D designs have very low power supply rejection. Paradigm’s Ultra-Class-D™ design inherently rejects variations in the power supply. 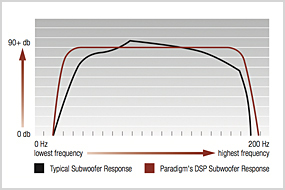 Paradigm’s Digital Signal Processing (DSP) Design. Sophisticated mathematical algorithms “shape” the frequency response, ensuring accurate, consistent and musical bass without audible distortion, even when the subwoofer is playing at its loudest level.